Are you a Crowd Tapper yet? I am and let me tell you, it has been a fabulous experience. I have been a part of four sample & share opportunities in which myself and three friends were given coupons to do some shopping at Old Navy on the house. First was ankle jeans, then was Spring dresses, the was an accessories party, and now is Summer shorts . I haven't gone shopping for the shorts yet, but the coupon allows me 1 pair of shorts, 1 top, and one accessory which includes shoes, bags, belts, hats, scarves, & jewelry. Fun huh? A whole outfit for me & 3 friends - totally FREE! How is all of this available you ask? I joined the site, and just did what they asked. Which is mainly what is called quick hits. Quick hits come to your inbox and are a series of questions designed to get your real opinion on products and your consumer habits. An example of a question might be " Do you own an SUV?". Then there are multiple choice answers for you to choose from. That's it. They come in groups of maybe ten questions, once or twice a week. For each quick hit, you earn points and a chance at cash. As you earn more points, you move up in level. I moved very quickly. I find the quick hits fun and as soon at they hit my inbox, I'm on it. Once I got to level 5, I started receiving offers for product sampling. Simple as that! I just wanted to let all of you know about this. Anyone can join. It's fun and takes nothing away from me - I don't feel tied down, or bombarded. I just feel like I'm a part of a great community that offers great opportunities. 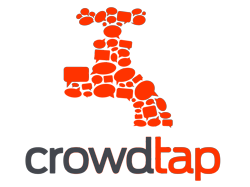 I expect that as Crowdtap grows, so will the fun opps! I'm so glad to see some of my readers signing up! Just do all your quick hits and you'll be doing the really fun stuff in no time!